We’d love your help. Let us know what’s wrong with this preview of 100 Not Out by Gordon Lawrie. 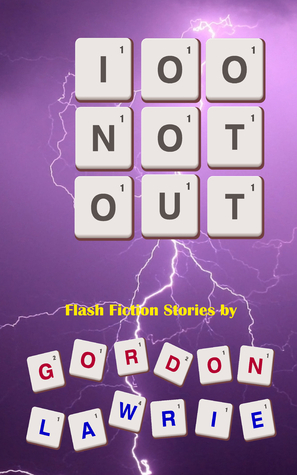 100 Not Out is a collection of some of Edinburgh author Gordon Lawrie's best 100-word flash fiction stories. Published initially over the last few years in Friday Flash Fiction, they explore every genre – including science fiction, crime, romance, historical fiction and, above all, humour. They're intended as a diversion, to be read on a bus or train journey, perhaps, occa 100 Not Out is a collection of some of Edinburgh author Gordon Lawrie's best 100-word flash fiction stories. Published initially over the last few years in Friday Flash Fiction, they explore every genre – including science fiction, crime, romance, historical fiction and, above all, humour. They're intended as a diversion, to be read on a bus or train journey, perhaps, occasionally thought-provoking but never challenging, and the flash fiction format ensures that the reader is never bored. This is risk-free reading. To ask other readers questions about 100 Not Out, please sign up. Searching for something to read for your commute - whether that's for work or for a flight out on summer holidays? Try 100 Not Out. The author has collected together examples of his flash fiction, i.e. very short stories, grouping them in categories such as love, crime, politics and more. Many of the stories will make you laugh out loud - they will certainly make you think. A light, but satisfying read. I'd thoroughly recommend it. Born in 1952, Gordon Lawrie taught Modern Studies - that's politics in Scotland - for 36 years in an Edinburgh secondary school, writing occasionally for educational magazines or in political science journals. Then he saw the light... and tried his hand at writing a novel or two, coming up with Four Old Geezers And A Valkyrie at the turn of 2012. Today he lives in Edinburgh city centre. Although th Born in 1952, Gordon Lawrie taught Modern Studies - that's politics in Scotland - for 36 years in an Edinburgh secondary school, writing occasionally for educational magazines or in political science journals. Then he saw the light... and tried his hand at writing a novel or two, coming up with Four Old Geezers And A Valkyrie at the turn of 2012.